Have you ever been told that your work is too expensive? It’s never really about the price. Since we’re not in the buyer’s mind, we may never know exactly what was holding them back. BUT….we can still try to find out while possibly helping the buyer, and making a sale, in the process. The next time someone remarks that the price is too high, yet they seem like they’re seriously interested in your work, start a conversation with them but go in prepared. There are things you can do to potentially still make the sale that also makes the experience less dramatic and energy draining to you. Shift the conversation from being about how your work is too expensive to getting someone to truly consider purchasing it by following these tips. And since writing down the answers to these questions will give you the confidence you need to be prepared when someone says your work is too expensive, fill out this free worksheet so you’re not thrown off your game the next time someone says they can’t afford your work. Tip #1: Start with YOU. It may be really hard not to take offense when someone complains that your work is too expensive or that they can’t afford it, especially when it sounds like it’s delivered in a insulting tone even if they don’t intend for it to come across that way. As you read on, you’ll see how this kind of conversation is actually a great chance to learn more about your audience of potential collectors. Wouldn’t it be great to know what’s running through their minds as they’re considering making a purchase? You get to decide how YOU respond in this situation. Happily, angrily, dismissive or perhaps, with a more constructive response. One of curiosity, learning, and being impressively professional. You have complete control over how you choose to take that comment AND how you choose to respond. Knowing that this has nothing to do with the potential buyer actually makes it a little easier because picking your response now means you won’t be blindsided and give an emotional response instead of a professional one. Planning ahead for what you’ll do in this situation helps you stay in control of your feelings. Even if a comment like this makes you feel like you were were just slapped in the face, you can come across as a kind and professional artist if you give it a little thought right now. Example 1: I can understand how it might feel that way. Tell me what you’re thinking about the piece and the price. This response is designed to get them talking and thinking more about the art and what they’re really looking for. Example 2: That’s great feedback but this work is priced this way because…. Tell them why your work is priced this way. Explain that these are retail prices, not wholesale prices because you don’t want to lose your gallery by underselling them. If you use expensive materials or processes, explain what those are and how that makes your piece more unique. If there’s a certain number of hours that are involved with making each piece, mention that, too. Whatever response you decide upon, it should feel genuine to you and helpful to the potential buyer. Avoid a response that gets you fired up. Tip #3: Are You Willing to Sell It For Less? If someone says that your price is too high, it’s your prerogative to decide if you’d like to offer it for less. There are a whole host of reasons why selling it for less might make sense. Perhaps you’re literally running out of room to store the work. Or, energetically it would make you feel great to sell the work so you can make emotional and physical space for your next project. Perhaps you need to pay some bills, or you’d like extra cash for your upcoming vacation. To really be able to fully answer yes or no to this question, there are two things you need to be clear about. Price: Why is your work priced the way it is? If you have clarity on why your work is priced the way it is, it makes it easy to either stand tall on your prices because you won’t make money if you go lower, or to offer a discount because you know that you’ll still make money on the work, even at a reduced price. Why: What are the reasons that you’d be okay with selling your work for less? When someone asks for a discount? When selling to someone you know? When selling to a gallerist or influential person? When the work is damaged? When you sell multiple pieces to one collector? If you’re offering a discount, what is your reason? And are you okay with that reason? Brainstorm ideas that might allow you to feel more comfortable coming down on your price. Can you come down on your price if they take the piece with them today so you don’t have to deliver it? How about if it’s unframed, will that bring down the price and allow you to re-use that frame for another piece? How about offering a payment plan? They can put down a deposit now and pay once a month for 2-3 months until it’s fully owned by them. Do you have other work that’s similar in style that is less but would still help them fill that spot on their wall with one of your pieces? Maybe prints that are less expensive than originals? Or several smaller pieces that can be grouped on the wall to give the feeling of a larger piece? What other ideas come to mind that would allow you to find similar, helpful ways for a collector to consider buying your work? If you show that you’re not offended by this dreaded statement of your work being too expensive and you view it as a conversation starter instead, you may wind-up selling your work. You may also help that collector go home with a new piece of art that they can proudly hang in their home or office, even if they originally felt your work was too expensive. True, you may not wind-up selling the work. But by talking calmly and professionally with the collector, you’ve just shown them that you’re a stand-up artist who is credible and knows their business, an their worth. They’ll leave your studio with a feeling of respect for what you do and you might be surprised when they come back in a few months or a year and buy your work. Acting offended when someone says your work is too expensive will never get a collector to come back again. But if you prepare for this kind of collector interaction, it will. What you do when someone said your work was too expensive? Have you had it happen before? Leave me a note in the comments to share it with me. Knowing why you’ve priced your work the way you have translates as the number one way to be confident when selling your work. 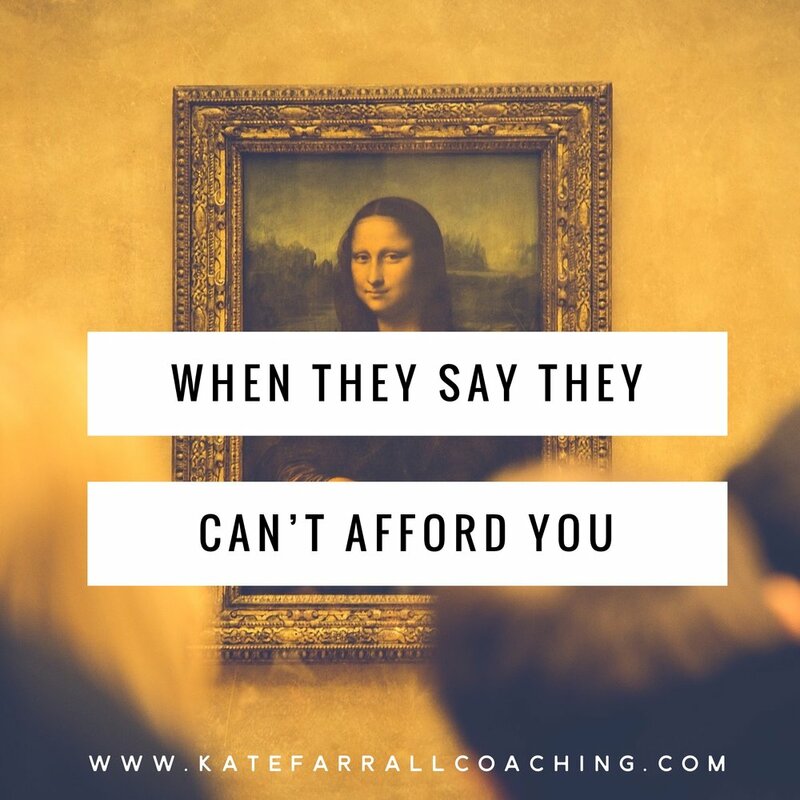 If you’ve had a nagging feeling that you’ve based your prices only on what felt “right”, I’d love to help you get to to where you feel confident and happy with the prices you’re asking. I totally understand that sometimes you don’t know what to sell your work for. Especially if it’s a new series or if you haven’t sold one yet. It can be so overwhelming to settle on an amount for one piece not to mention pricing all of your completed works. To help with this, I created a live and in-person workshop on Monday, June 4, 2018 called Sell Confidently: Pricing and Selling Your Work. It’s designed to help you feel confident about how you price your work and selling it with a sense of pride. If you’d like to learn more about the Sell Confidently workshop, check out the details here. Posted on April 30, 2018 by Kate Farrall.